ONEhalf20 offers a complete line of Melt Pressure Transducers for extrusion and polymer processing. All units feature as standard the 6 pin Bendix style bayonet connector, and offer the industry standard 3.33 mV/Volt output. Melt Pressure Transducers from ONEhalf20 are also avaialble for food and medical processing applications. 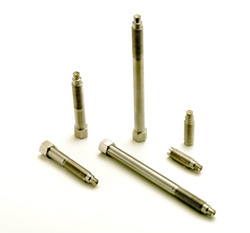 Our melt pressure transducers are fully compatible with all melt pressure transducers incorporating the Bendix six pin bayonet connector. ONEhalf20 offers a complete line of Melt Pressure Transmitters for extrusion and polymer processing. All units feature as standard the 6 pin Bendix style bayonet connector, and offer either 4-20mA or 0-10Vdc output. Melt Pressure Transmitters from ONEhalf20 are also avaialble for food and medical processing applications. 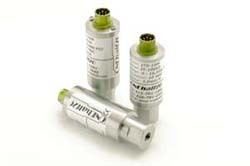 Our melt pressure transmitters are fully compatible with all melt pressure transmitters incorporating the Bendix six pin bayonet connector. ONEhalf20 offers a complete line of mechanical melt pressure gauges. 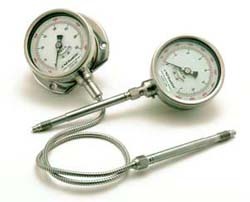 These low cost melt pressure gauges offer ease of installation and maintenance. In addition these gauges are ideally suited to processors who require only visual indication of melt pressure. Melt Pressure Gauges from ONEhalf20 are manufactured from stainless steel and have been designed to provide years of trouble free service. They feature a large 4.5" dial face, and are available in either 0 - 5,000 or 0 - 10,000 psi ranges (dual scale bar and psi). 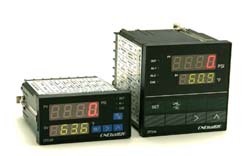 ONEhalf20 offers a complete line of panel mount pressure instrumentation for a wide variety of applications. Units feature built-in alarm contacts, transducer or transmitter excitation voltage. Most models offer as a standard feature 4-20mA process value re-transmission. Some models are available with both simultaneous indication of both pressure and temperature. ONEhalf20 offers a wide variety of transducer and instrumentation accessory items to aid in product installation and performance. Choose from a wide variety of interconnecting cables and connectors as well as 1/2-20 UNF mounting hole ancillary items. ONEhalf20 Extruder Rupture Disks (Burst Plugs) are primarily used on Plastics Extrusion Machinery to provide emergency pressure relief. Extruder Rupture Disks from ONEhalf20 are designed to instantaneously rupture at a pre-determined pressure. Extruder Rupture Disks are leak tight and intrinsically safe devices that require no maintenance. ONEhalf20 Extruder Rupture Disk assemblies are manufactured from 304 SS and incorporate either an Inconel or Stainless Steel Disk which minimize the affects of varying processing temperatures. The RD Series of Extruder Rupture Disks from ONEhalf20 are offered in a wide variety of lengths and configurations. Standard stock assemblies are available in burst pressures ranging from 1,500 up to 15,000 psi, and lengths from 1.82 up to 12. ONEhalf20 offers a complete line of industrial pressure transducers and transmitters. ONEhalf20 industrial pressure transducers and transmitters are available in a wide variety of pressure ranges and process connections. ONEhalf20 industrial transducers and transmitters incorporate the Bendix style 6 pin connector and feature internal shunt calibration for ease of installation and setup. ONEhalf20 industrial transducers and transmitters are manufactured entirely from stainless steel and are designed to provide years of reliable trouble-free service.